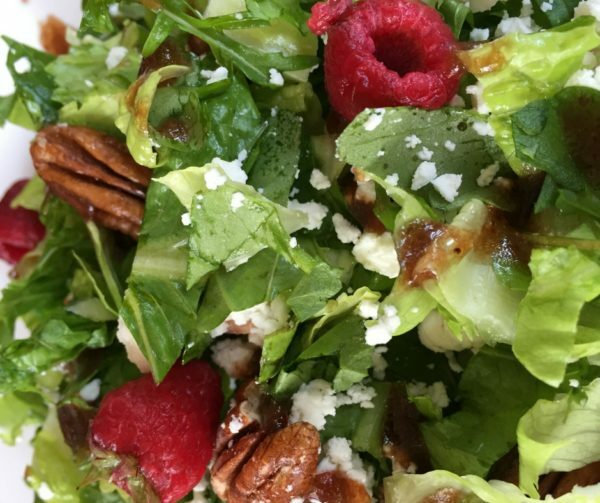 Red Raspberry and Candied Walnut Salad with Raspberry Vinaigrette might have a long name, but this salad is anything but complicated. I absolutely love to make this salad when I want to make lunch or a side for dinner that is simple, quick and bursting with flavor. Because this salad is quite basic in many ways, using only 4 ingredients like fresh Romaine lettuce, fresh raspberries, candied walnuts and goat cheese, you can pretty much custom design the salad the way you like. Feel free to change out the raspberries for blueberries, blackberries, strawberries or your favorite fruit. Use feta or Parmesan in place of goat cheese if you are not a fan. Try plain walnuts, cashews or what ever nuts you have on hand. The magic of this salad is actually in the dressing. Lightly sweet, slightly tangy and extremely flavorful. I suggest going light on the dressing at first and then layering in as much as you prefer once you get a taste of the flavor. I tend to like my salads very flavorful but others might like just a touch of the dressing to enhance the flavor of their salad. Once you make this recipe you’ll love the simplicity of it all while becoming pleasantly surprised at how much flavor bursts from 4 simple ingredients and just a little bit of dressing! 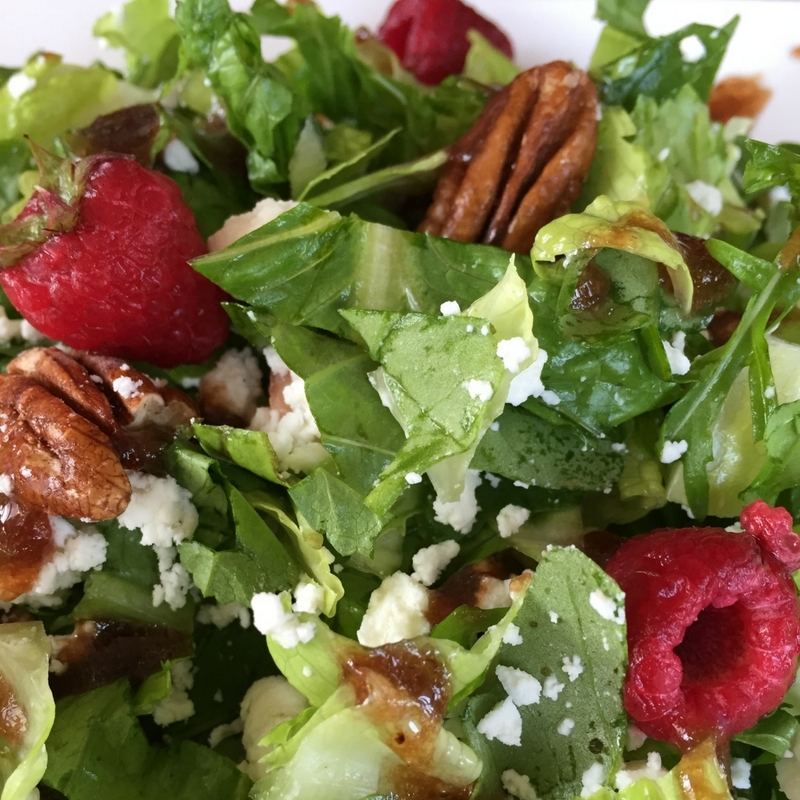 This salad burst with the tangy flavor of raspberries and creamy goat cheese coupled with the sweet nutty flavor of candied walnuts. Beautiful and delicious! In medium non-stick pan, heat butter until melted over medium heat. Add in brown sugar, cinnamon and walnuts. Saute 3-4 minutes, stirring continuously so it does not burn. Using spatula, remove walnuts from pan and set on a lined baking sheet to cool for one hour before placing on salad. In a small blender, add raspberry preserve, balsamic vinegar, mustard, and salt. Blend on high for 15 seconds. Pour liquid into bowl and slowly whisk in olive oil until thoroughly combined. Chop the lettuce into small bite size pieces. Place lettuce on individual salad plates or in a large salad bowl if you are making one large salad. Add Raspberries and 3/4 of the goat cheese. Set aside. Drizzle the salad with dressing. Sprinkle remaining goat cheese on top of salads and serve.